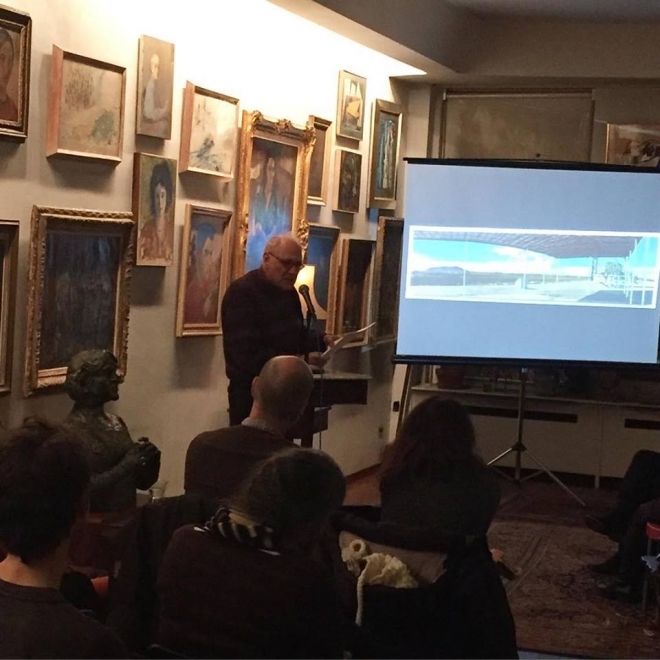 The Greenwich Village Society for Historic Preservation (GVSHP) discussed Chaim Gross's sculpture The Family in Bleecker Street Playground as well as the Foundation's history and current activities to celebrate Gross's birthday on March 17. The sculpture was donated in honor of former New York City mayor Edward Koch. 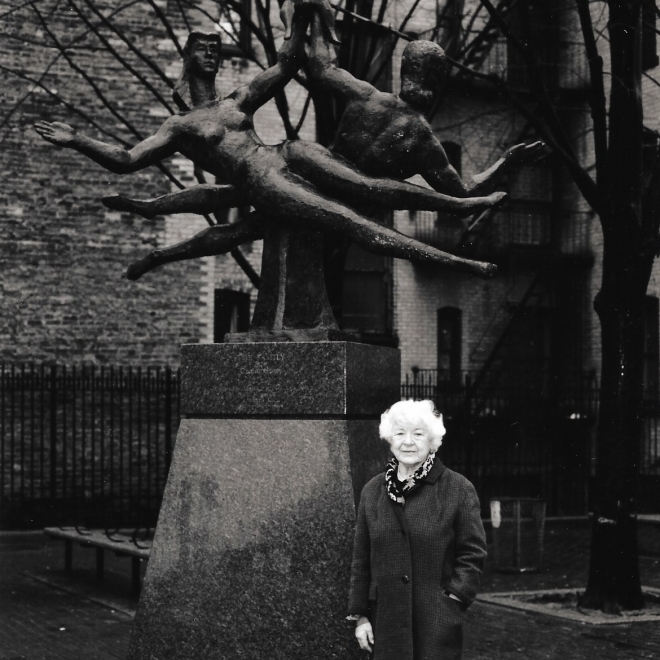 This photograph of Renee Gross was taken at the sculpture's unveiling on December 3, 1991 by Richard Alan Fox. The Foundation is excited to announce the return of Sylvia Carewe’s Untitled (Dutra Taxi) to LaGuardia Place following conservation treatment. The conservation of this painting was made possible by the NYSCA/GHHN Conservation Treatment Grant Program administered by Greater Hudson Heritage Network with public funds from the New York State Council on the Arts. 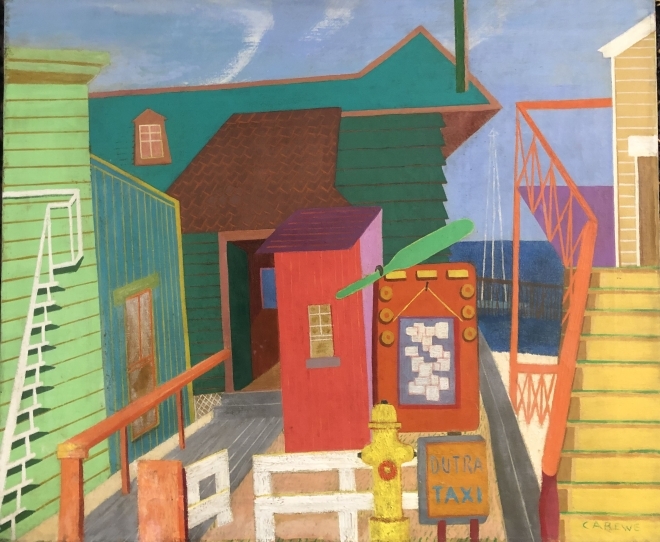 Untitled (Dutra Taxi) will travel this summer to the Provincetown Art Association & Museum for the loan exhibition Circa 1945: Abstract Art from the Renee & Chaim Gross Foundation Collection, July 19 – September 15, 2019. 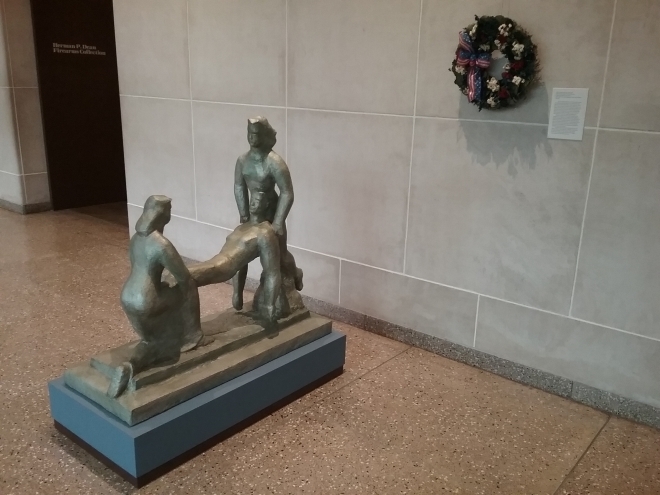 The Huntington Museum of Art in Huntington, West Virginia installed Chaim Gross's 1942 sculpture In Memorium of Captain Colin Kelly in one of their central galleries in honor of Veterans Day. Gross created the plaster maquette to honor the sacrifice of Captain Colin Kelly, a World War II pilot who was celebrated for his heroism after ordering his crew to bail shortly before his B-17 bomber was destroyed near Clark Air Base in 1941. Gross showed the sculpture in the Sculptors Guild's Fourth Annual Outdoor Show from September 15 - October 15, 1942 on the roof of Rockefeller Center. The Hungtington Museum of Art recently acquired the work and completed extensive conservation work. 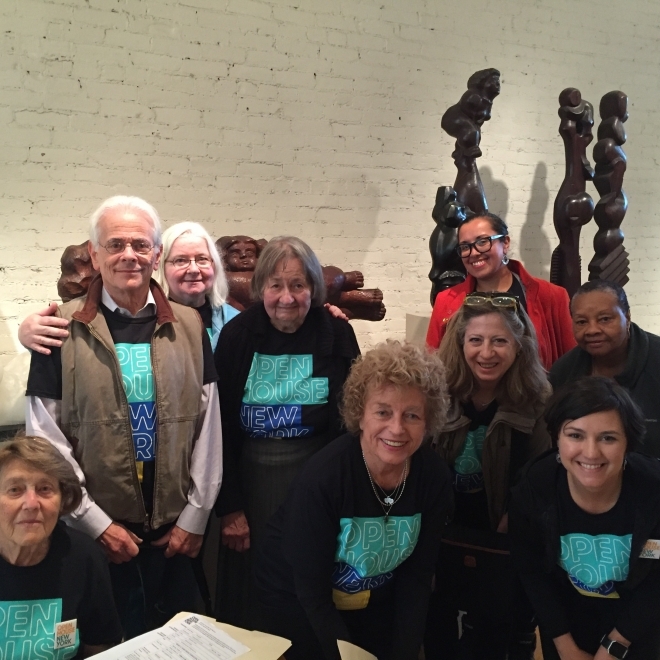 With the help of Open House New York volunteers, the Foundation welcomed 1,000 visitors during the weekend of October 13-14, 2018. 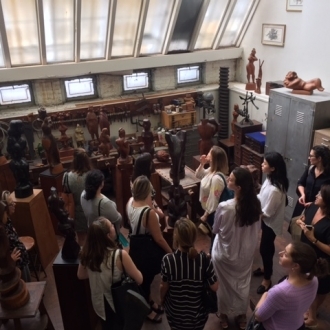 Visitors were able to visit the first floor gallery and studio, the temporary exhibition Teaching Through Touch: Works by Chaim Gross, and the historic living spaces on the third floor. 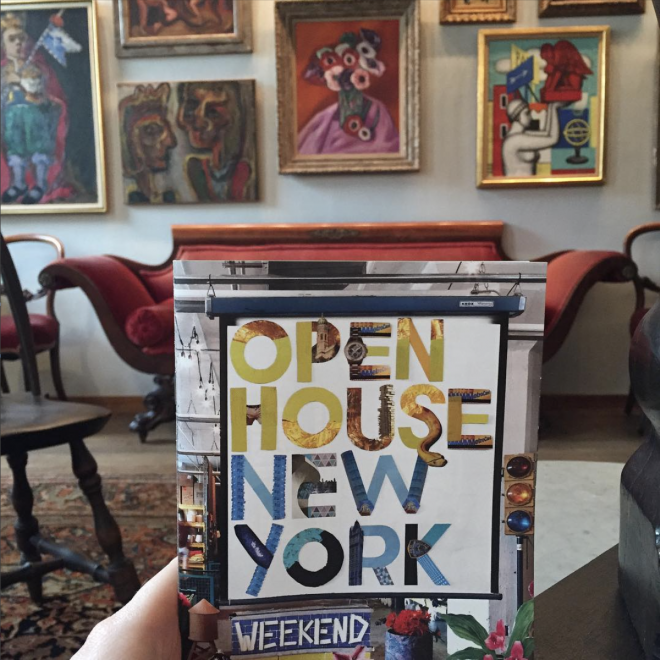 Open House New York Weekend is a citywide celebration of architecture, urban design, and New York City. Every October, more than 250 buildings and projects across New York's five boroughs open their doors to the public for tours and talks with architects, urban designers, historians, preservationists, and city leaders. The Foundation's Salon-style installation of works on paper in the third floor dining room inspired designers to create the teal rectangle pattern on the lower righthand corner of the 2018 OHNY Weekend Event Guide. 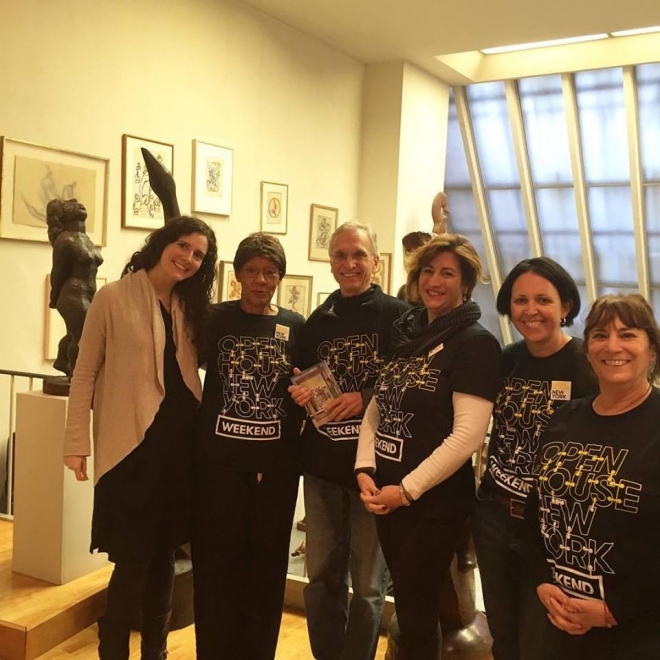 The Renee & Chaim Gross Foundation is currently seeking volunteers for our new Volunteer Educator Program. 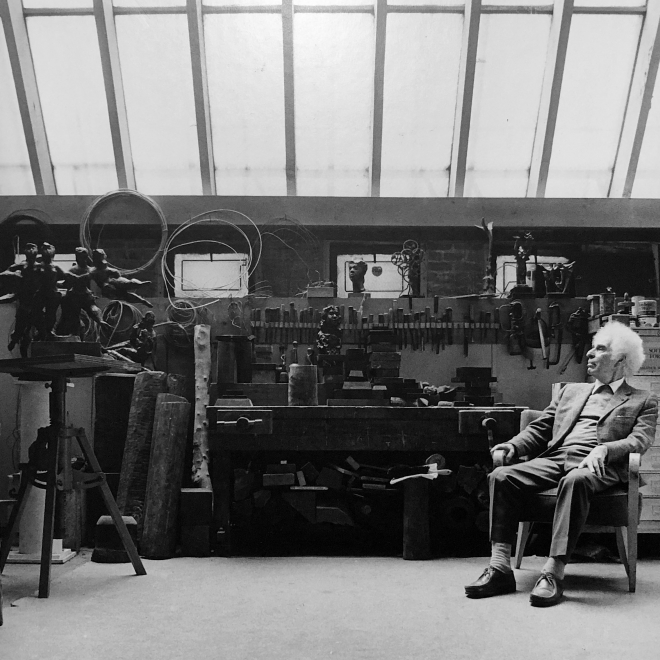 The Foundation's mission is to further the legacy of Chaim Gross through high-quality research, exhibitions, and educational activities around our historic building and art collections for audiences in New York City and beyond. 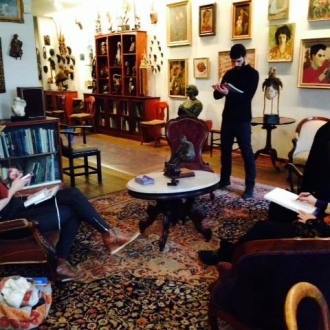 We are looking for volunteers who are intellectually curious, excited to converse with a diverse group of visitors, and passionate about sharing the home, studio, and art collections of the Grosses with a larger public. The aim of the Volunteer Educator Program is to increase our hours and availability to better serve our visitors. We request a time commitment of two years with one to two tours given per month after the conclusion of educational training. 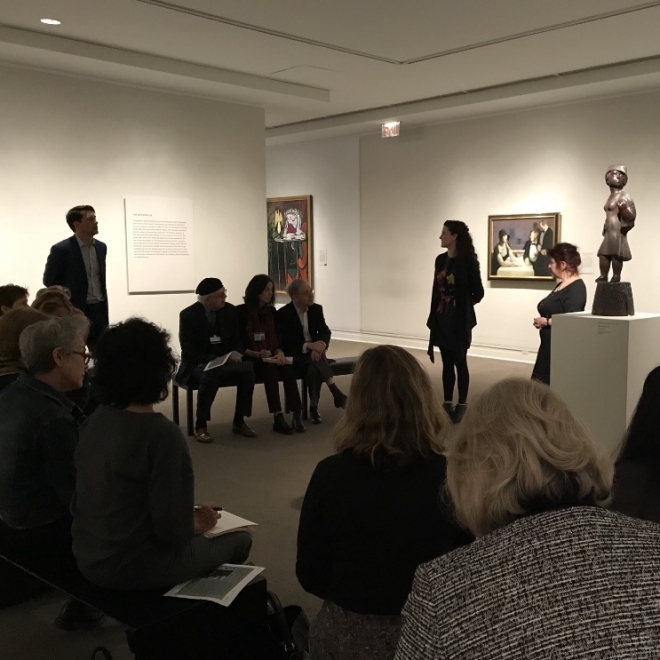 The educational program features guest lecturers and highlights multiple aspects of the collection, biographies of Renee and Chaim Gross, and historical context. The series takes place Wednesday evenings, 6-8 pm from January to March 2019. Volunteers must be able to use email and Google Docs when communicating with Foundation staff and other volunteers. We are excited to reach new visitors through this program. 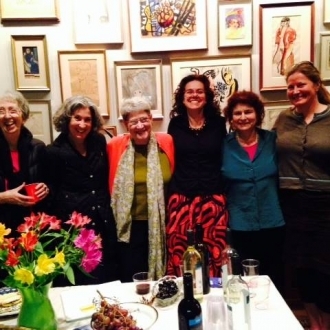 If you have interest in becoming a Volunteer Educator, please join us at our initial reception on October 10 at the Renee & Chaim Gross Foundation. Applications are due November 8, 2018 and are available below. The Board and staff of the Renee & Chaim Gross Foundation are pleased to announce the appointment of Dr. Susan Fisher to the Board of Directors. 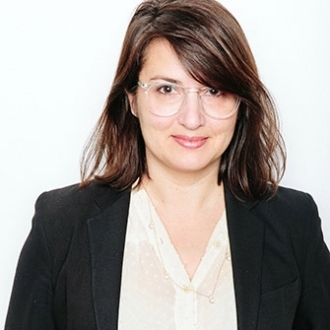 Dr. Fisher is the Acting Chief Curator and Director of Collections at the Brooklyn Museum, and served as the Foundation’s Executive Director and Chief Curator from 2009 to 2017. 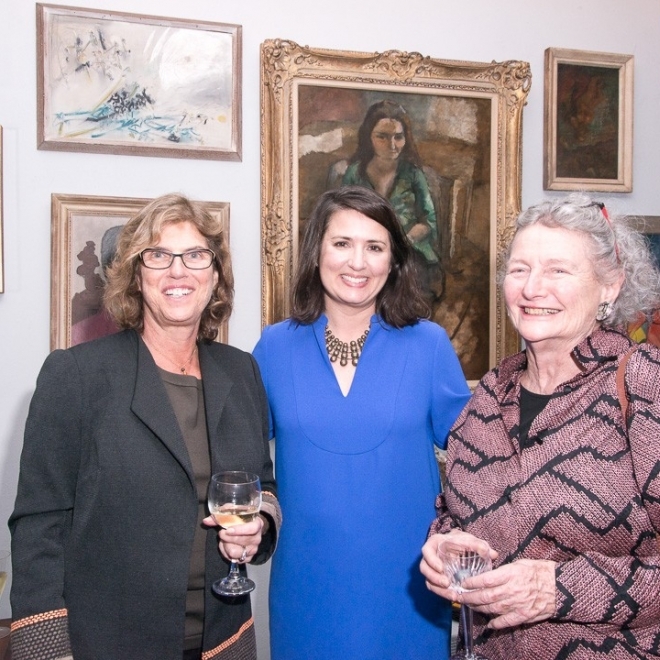 In sharing her thoughts about the appointment, President Mimi Gross wrote, "A serious worker, a shining light, a loyal and close friend, charming and intelligent, Susan has given us a gift for the sustainability of our modest Foundation." 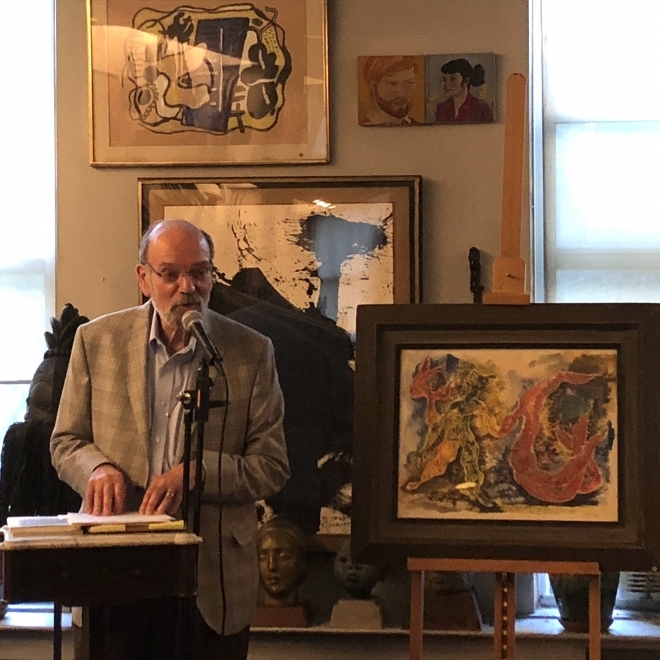 The Foundation hosted a reading by Dr. Barry Zaret, whose 2017 book of poetry, When You Can't Do Any More, includes four poems in memory of Chaim Gross. Dr. Zaret is a renowned cardiologist who holds the title of Robert W. Berliner Emeritus Professor of Medicine and Senior Research Scientist at the Yale University School of Medicine. 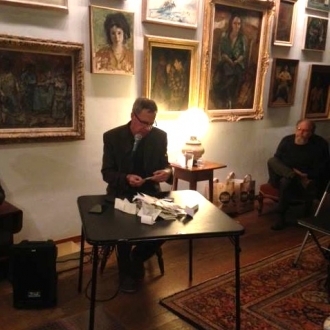 He is a painter, and published his first volume of poetry, Journeys, in 2012. 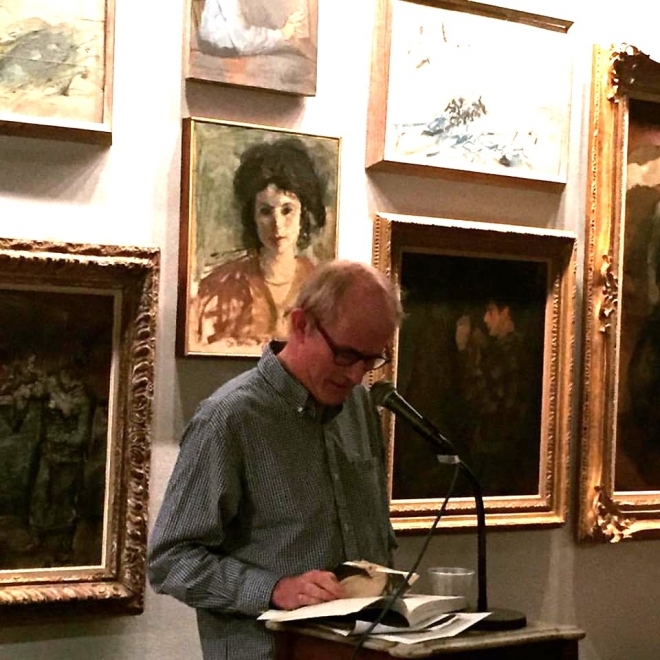 His poetry is drawn from his life experiences as a doctor, interest in the natural world, and his personal relationships. His friendship with Gross is exemplified in a poem about the studio and his contemplations of Gross's fantasy drawings. The poem "Wedding Day", a response to one of the fantasy drawings, can be read on Dr. Zaret's website. 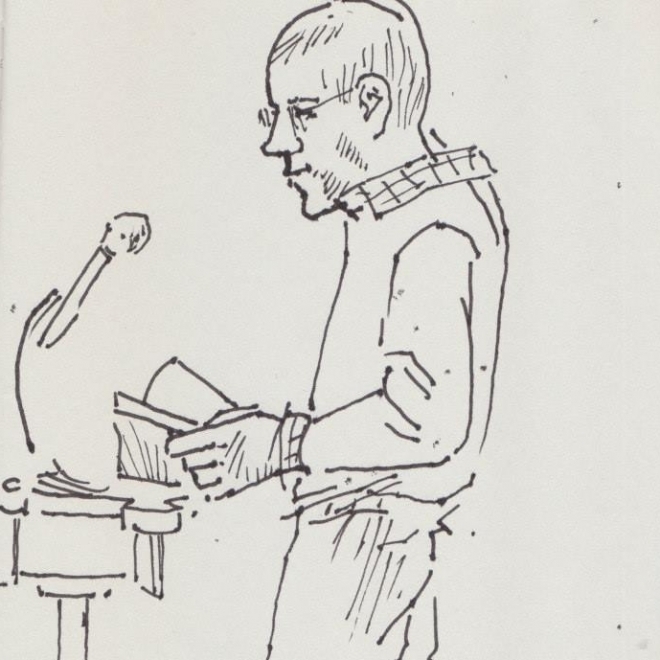 In addition to reading his poetry at the event, Dr. Zaret also shared his eulogy given for Gross in the summer of 1991. A link is provided below. 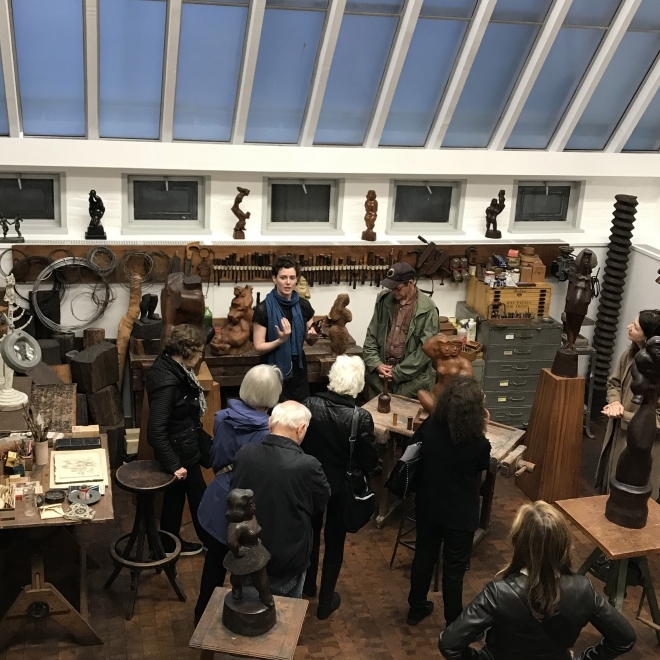 The Foundation welcomed over 100 visitors on Thursday, May 10 for a special reception to celebrate the reopening of Chaim Gross's historic sculpture studio. The Foundation also had free open hours on Saturday, May 12 for those visitors unable to attend the reception. 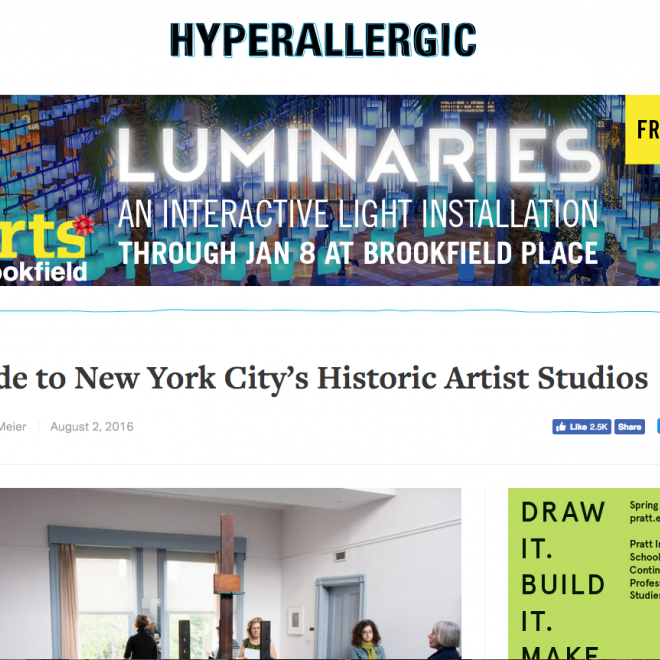 The studio had been partially closed since summer 2017 when water infiltration at the base of the skylight threatened to damage the sculptures, tools, and materials housed below. 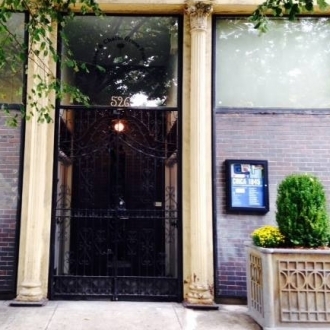 The Grosses purchased the 526 LaGuardia Place building in 1962, renovating the space to accomodate Gross's dream of combining his home and studio in one building; the dramatic, modernist skylight was one of the features put in at the time. This unique space has been returned to its original appearance, and the space is now available for tours. The restoration project is generously supported by The New York Landmarks Conservancy and the NYC Landmarks Preservation Commission. 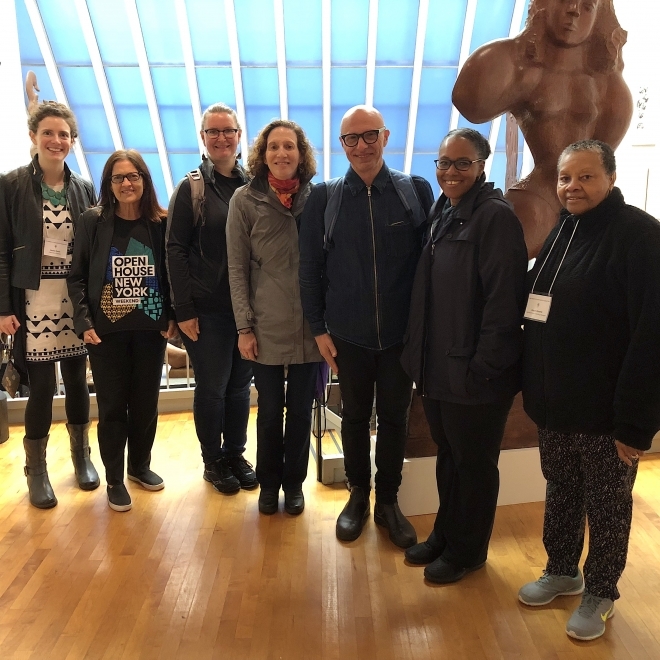 East Side Girl, a prominently displayed early wood sculpture by Chaim Gross at the Metrpolitan Museun of Art, was hightlighted in a special conversation with 30 Metropolitan Museum of Art volunteer educators on April 18, 2018. The discussion was led by Dr. Randall Griffey, Associate Curator of Modern and Contemporary Art and Gross Foundation advisory board member. Board President Mimi Gross shared her memories of her father and information on his technique, style, and content. 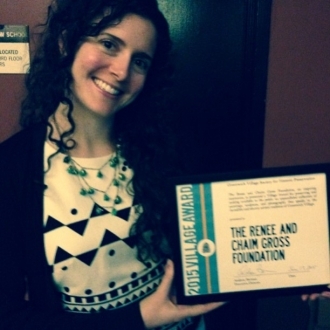 Executive Director Sasha Davis provided information about the Foundation and Gross's biography. The Foundation is thrilled to join the National Trust for Historic Preservation's Historic Artists' Homes & Studios (HAHS) program along with three other sites. 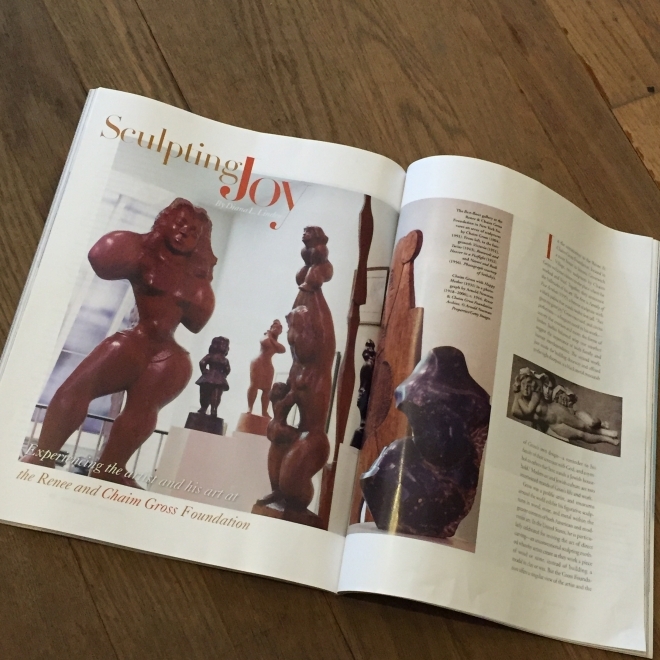 Scholar Diana Linden explores Gross's work and the Foundation in "Sculpting Joy"
Welcome to our first UA intern, Cynthia Bergello! 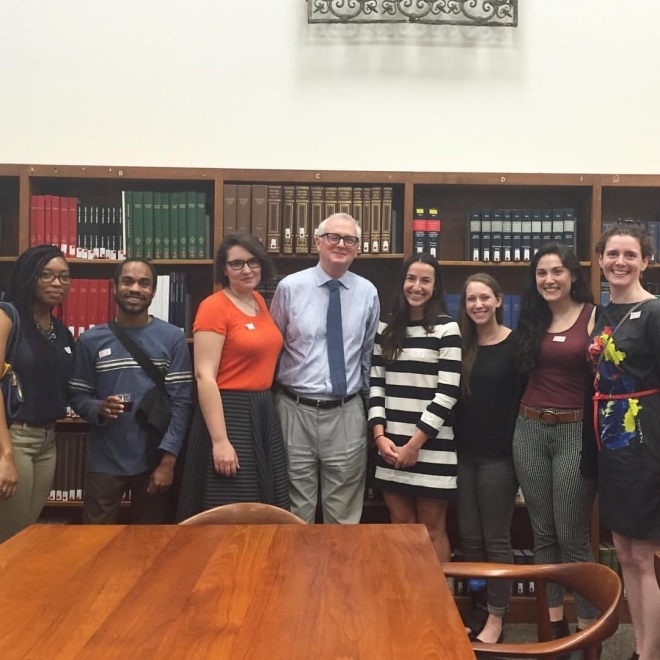 Over 20 interns from the 16 non-profit arts organizations in the SoHo Arts Network were welcomed by Ken Soehner, Chief Librarian of the Watson Library and other staff at the Metropolitan Museum of Art for a behind-the-scenes look at this renowned research library. 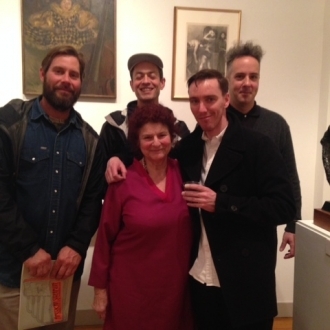 They were also introduced to new acquisitions, including modern and contemporary artists' books. 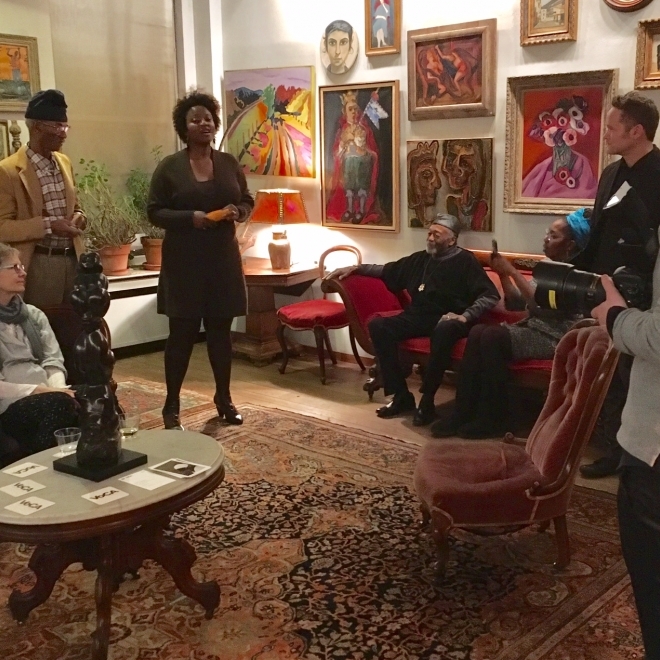 In partnership with the SoHo Arts Network, the Foundation hosted a free and interactive public program with the SoHo Memory Project to learn about the history of SoHo as a New York City neighborhood. 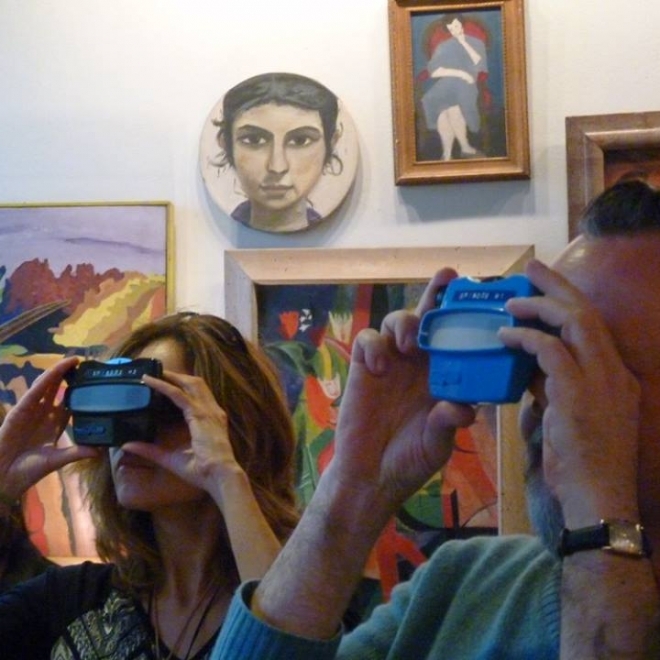 SoHo historian Yukie Ohta presented the SoHo Memory Project Portable Historical Society, a mobile museum featuring the sights, sounds, and smells of SoHo in the 1970s through such unconventional media as Viewmaster viewers, 3-D printed miniatures, and a smell station. For the first session, Ohta gave a lecture and presentation, and for the second session, the Foundation hosted the SMP's mobile museum outside on LaGuardia Place for special Saturday hours. 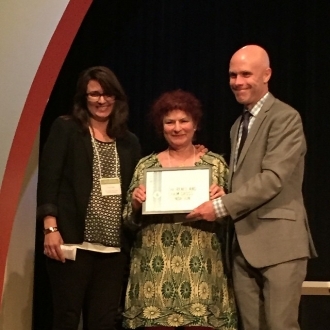 The program was generously supported by a grant from the New York Council for the Humanities. The Foundation's Curator of Collections Sasha Davis has been accepted into the prestigious Attingham Summer School for 2016. Sasha will travel to Britain in early July to study historic houses and collections with other Attingham fellows. 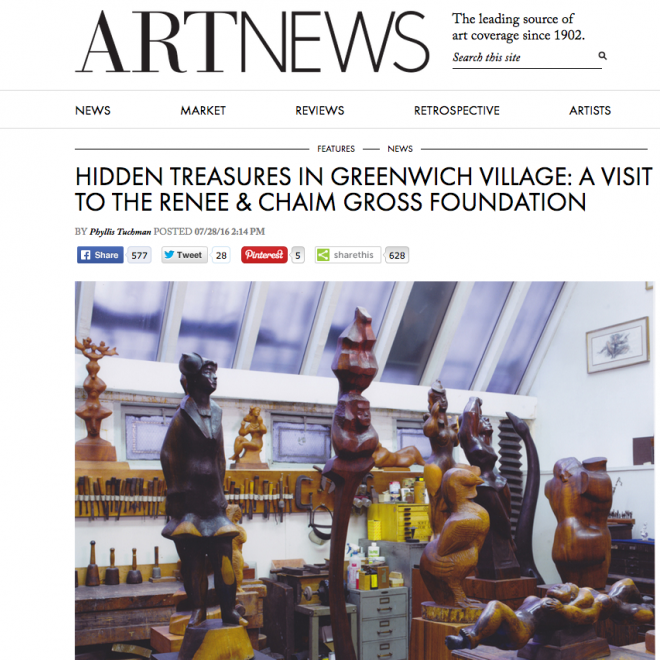 We look forward to learning from her as we continue to research, preserve, and share Chaim Gross's historic home, sculpture studio and art collections with our public. 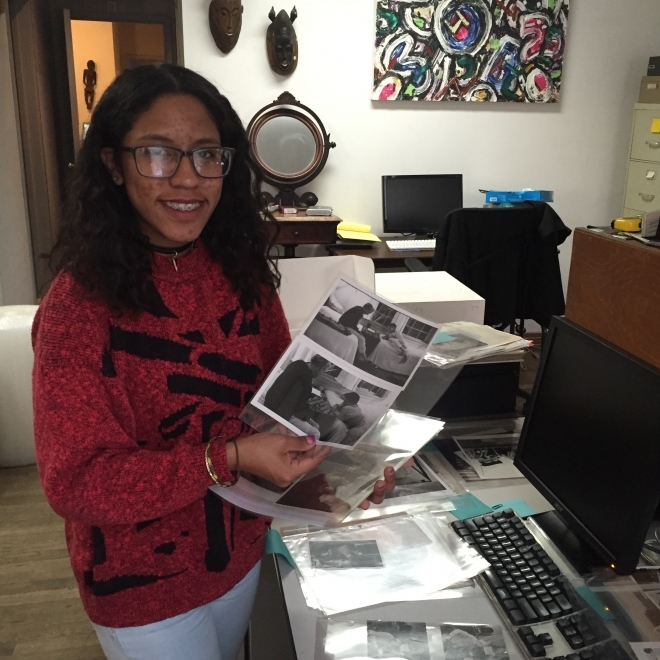 The Foundation offered a free and interactive public program with the SoHo Memory Project to learn about the history of SoHo as a New York City neighborhood. SoHo historian Yukie Ohta presented the SoHo Memory Project Portable Historical Society, a mobile museum featuring the sights, sounds, and smells of SoHo in the 1970s through such unconventional media as Viewmaster viewers, 3-D printed miniatures, and a smell station. This program is generously supported by a grant from the New York Council for the Humanities. 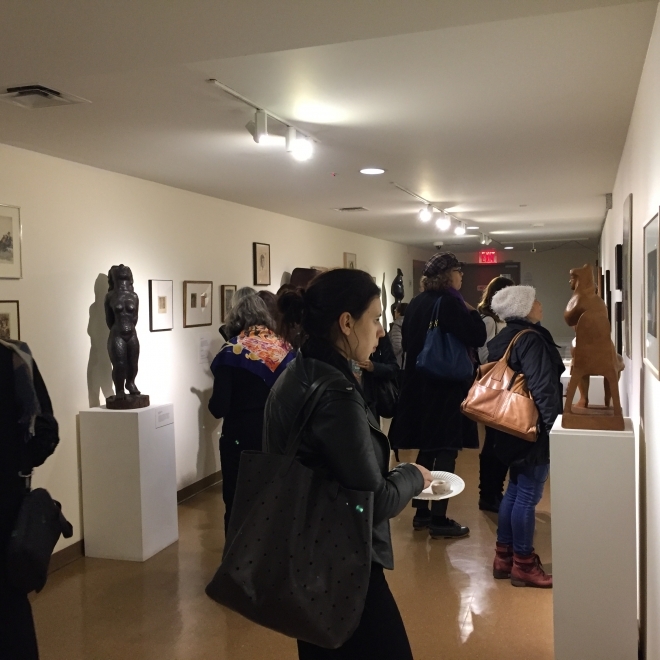 Elsie Smith gave a talk featuring the Visual Arts of Chaim Gross and photography from the New England Center for Circus Arts, and explored the circus-themed sculpture and drawings of Chaim Gross currently featured in the Foundation's 2016 special exhibit, Circus & Vaudeville. She used photographs from performances and classes at the premiere circus arts training school in the United States, as well as the real bodies that inspired the art, through the eyes of a world-traveled performer who has been featured with Cirque du Soleil and other companies. A live circus performance was also featured. 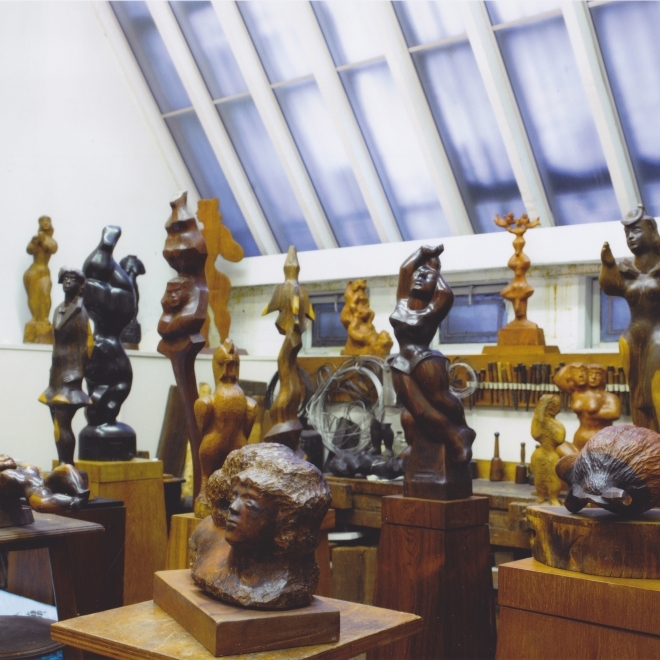 Students use Chaim Gross's sculpture and extensive collection of American, European and African art as inspiration. 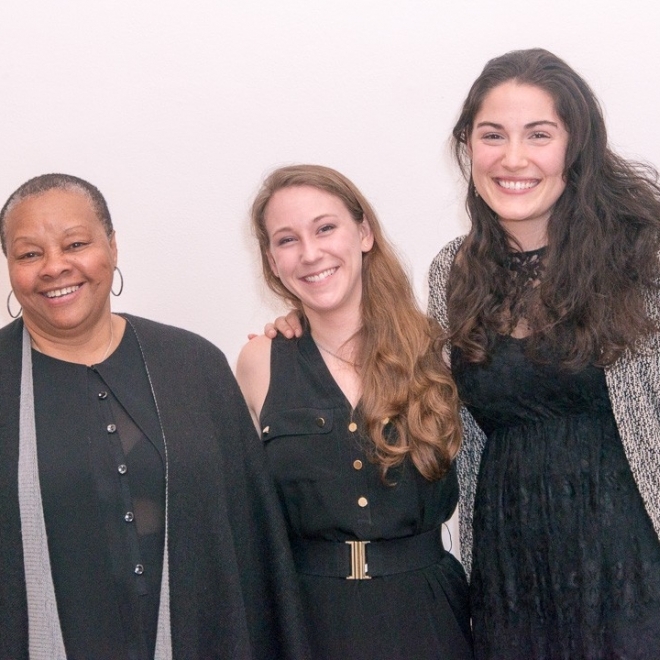 The Foundation and Center hosted a cocktail reception to celebrate the tremendous contribution both of these remarkable individuals have made to the creative arts. 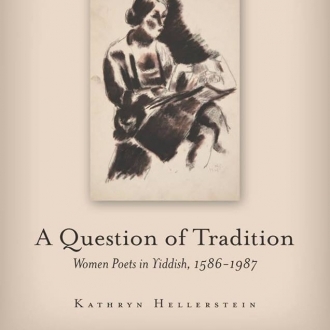 They responded to their Jewish heritage from distinct yet intersecting historical periods with a voice and vision that is both unique yet universal. 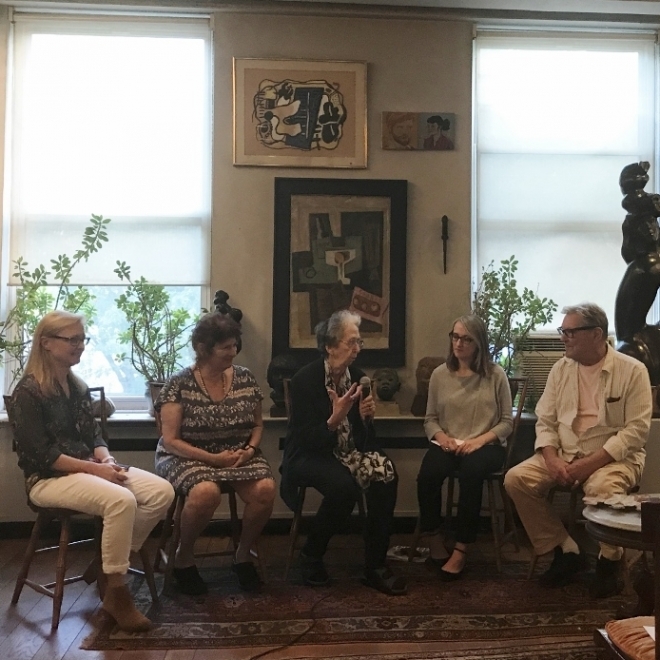 A specially curated tour of Chaim Gross's astounding private art collection was led by Dr. Susan Fisher, art historian and Executive Director of the Renee and Chaim Gross Foundation, with opening remarks by New York painter Mimi Gross, daughter of the artist. 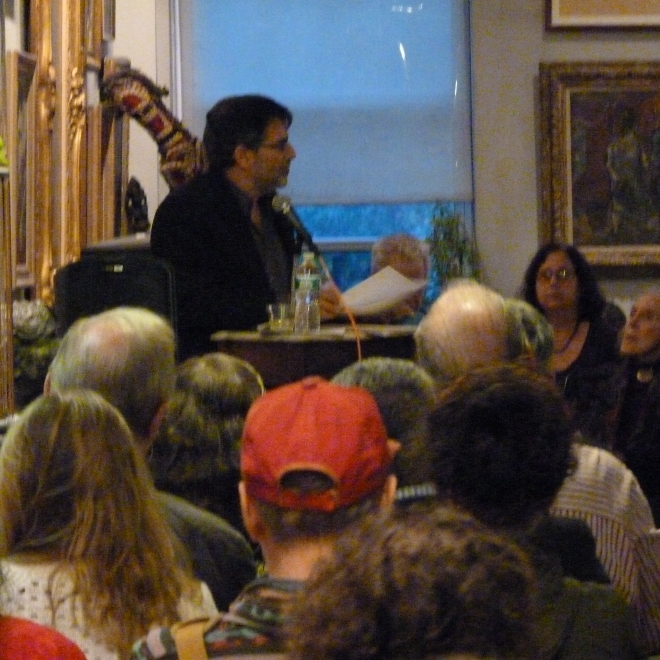 Public program in Conjunction with our 2015 Exhibit "The Word of Modern Art: Artists as Writers"
Poet and critic Raphael Rubinstein reads his "A Geniza"
Pettet reads his own work along with poems by Pablo Picasso, Louis Michel Eilshemius, and Marsden Hartley, and others featured in the Foundation's exhibition. 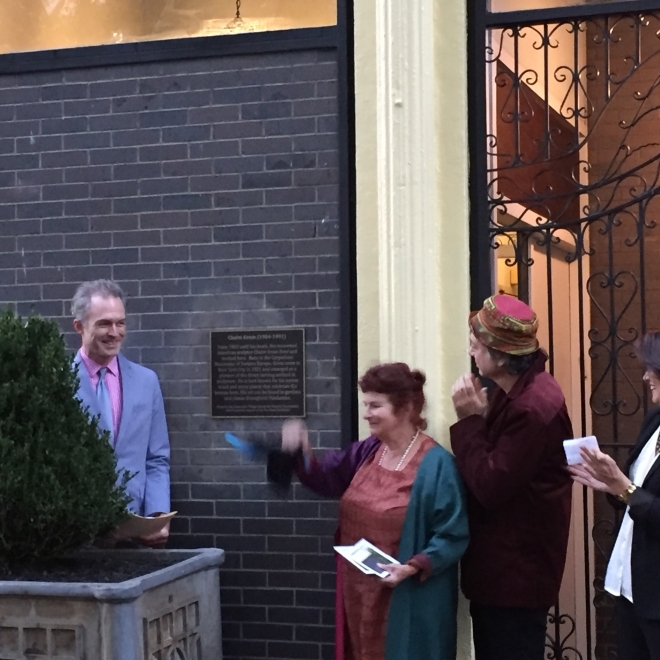 "The Foundation more than merits recognition and support for its contribution to the Greenwich Village community and its artistic heritage, and GVSHP is proud to recognize an inspiring institution which has preserved and made available to the public an unparalleled collection of paintings, sculpture, and photography that speaks to the incredible and inspiring artistic tradition of Greenwich Village." 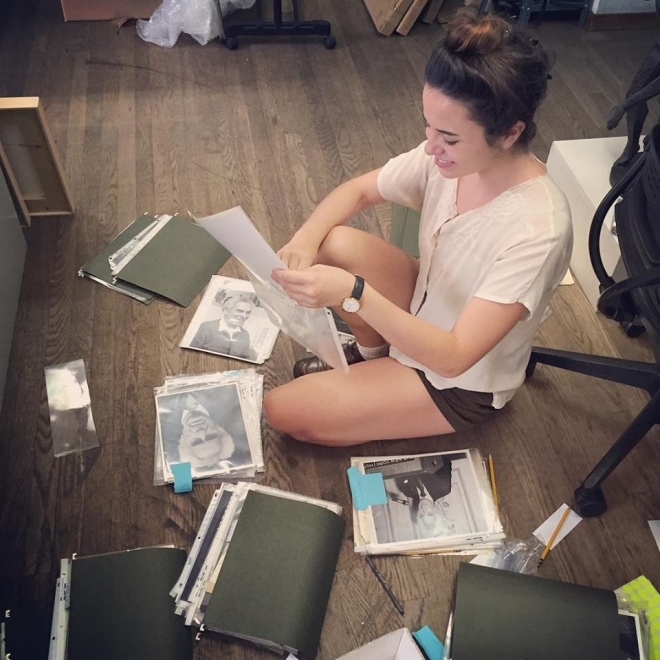 Dodge is also currently a Conservation Intern at the Hispanic Society of America. For many American artists—as diverse as Washington Allston, Marsden Hartley, Ad Reinhardt, Robert Motherwell, and John Cage—writing was an essential art-making procedure, connected to other creative practices. By considering both artistic and utilitarian writings of American painters, this three-day symposium offers a literary perspective on the contribution of artists’ philosophical and aesthetic thought to the development of American culture and society. Organizers aim to challenge one stereotype that artists do not create new ideas but merely interpret, in visual form, those of others. 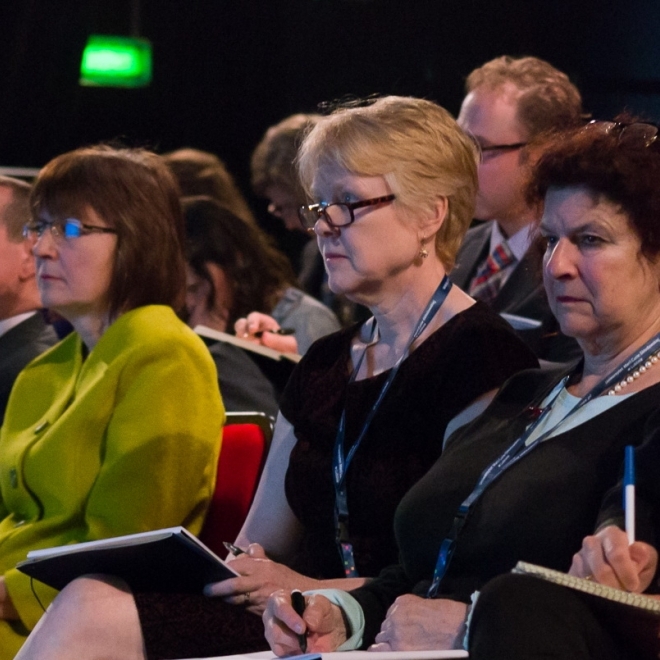 The entire symposium includes 13 sessions: six keynote lectures and 26 shorter presentations by scholars from Poland, Ukraine, Slovakia, Austria, Germany, France, Greece, Italy, the United Kingdom, the United States, and Canada. 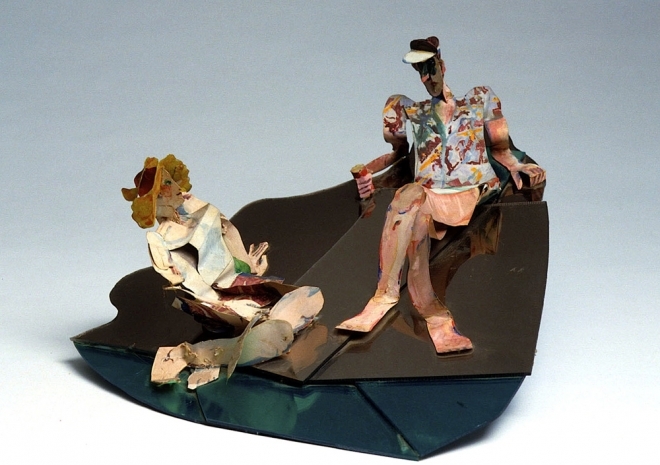 Exhibit includes two major works by Chaim Gross from the Smithsonian's permanent collection. Video of this event coming soon! 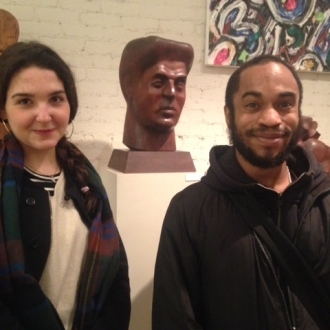 This year's interns are Noah Margulis and Elizabeth Akant.